I'm deep into my high school head space right now - the last bit of memoir I wrote and posted this past week, " I Was Just 17 " takes place the summer before my senior year, and since it's June I've got Graduation Day on my mind. 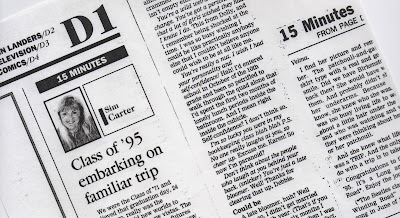 I wrote this almost twenty years ago with the class of '95 in mind; it's painful to see that the essay, published in the Daily Breeze in 1995, shows that the issues I struggled with back in high school are the same issues I struggle with to this day. What a waste of time. It's possible that if I spent less time flailing with self-doubt and spent more time honing my skills I might have not have given up, I might have something to show beyond a handful of old publishing credits. Again, I say, what a waste of time! Do yourself a favor, don't waste yours. 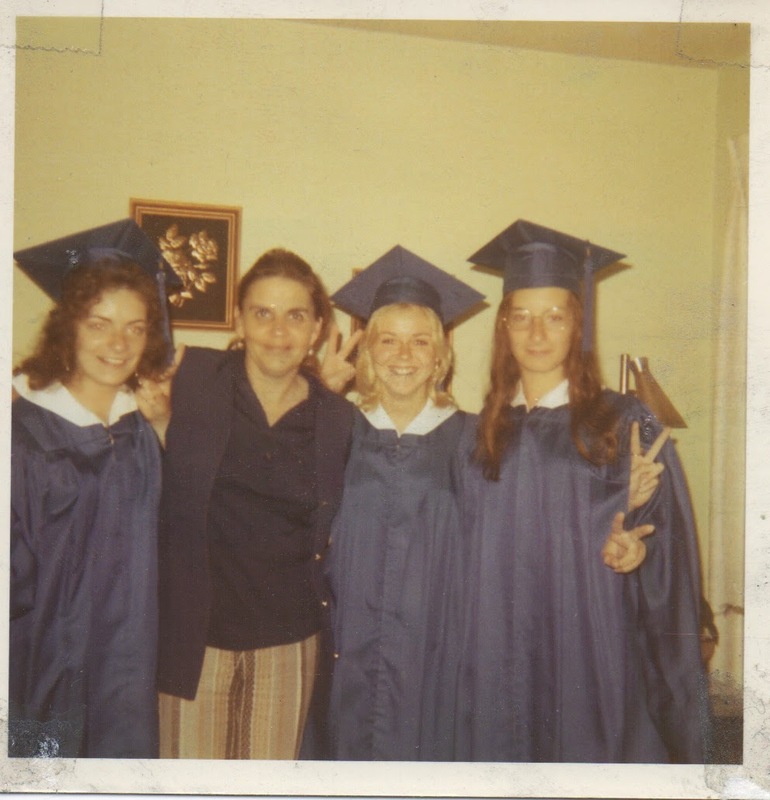 We were the class of '71 and believed that graduation day (now over 40 Junes ago), really was the threshold. Bold new worlds to conquer. Exciting new vistas. The magic. The mystery. Our futures were out there somewhere. A new day had begun. We were a swirling, twirling swarm of promise and potential ready to infiltrate the land and seize control. The SAMOHI Class of '71. The Soshes. The Jocks. The Potheads. The Science nerds. The Drama Wierdos. And the rest of us. Half of us didn't even talk to the other half for most of our high school careers, and suddenly here we were graduating together. United under a sea of blue caps and gowns, we floated on stage for our diplomas. Loved ones watched with tears caught in the corners of their eyes, something called pride bubbling in their throats. Hearts were leaping. Fathers coughing. Mothers sniffling. Cheering. There was much pomp and circumstance. I wore hot pants under my cap and gown. Pretty gutsy for a girl who felt too out of place to go to her own grad night celebration at Disneyland, who went to Westwood and stood in line with her best friend to see some long-forgotten movie instead. But then I was the girl who didn't even dare to dream about going to the prom, so I wasn't the least bit disappointed when I wasn't asked. Talk about your Ungreat Expectations. Leafing through the yearbook, I find my face on page 77. Hair a bit too bleached-out in those before-highlighting days. But an almost babe. While it isn't exactly crammed with entries, the book isn't empty either. You're a wild, weird chick. Don't change. You've got a personality that a lot of girls wished they had. I know I do. This from Dolly, and I remember being shocked at the time. I was so busy wishing I could be like practically anybody else that I couldn't believe anyone could wish to be at all like me. You're really a nut. I wish I had your personality and self-confidence! Hah! I'd entered school in October of the 10th grade and been so petrified to walk through the quad to eat lunch alone that I'd spent the first two months of lonely lunch periods inside the bathroom. And I mean right inside the cubicle. Self-confidence? I don't think so. I'm so lucky you were in my bookkeeping class blah blah P.S. No one really laughs at you, so cheer up. Excuse me, Karen! So now I'm paranoid? Don't think about the people who laugh at you behind your back (snicker) You're just a late bloomer. Well! Thanks for clearing that up, Debbie. It's a fact. The road to true love isn't always easy to find. So what was wrong with me? What accounted for my reticence? Paranoia? Why do I still feel a sting when I drive down Pico toward the beach and see the history building that housed the bathroom where I holed up? And then at the back of the book I see it. I find her picture and remember. The patchouli-and-gauzy-skirt type with a real and gentle smile. Did we have Birkenstocks back then? She would have worn them. And probably didn't shave her underarms. Because you know, she knew who she was. She was too busy living life to worry about a little hair under the arm and who was watching and what they were thinking about her pits or her patchouli. She knew what life was. It was a TRIP. And the only thing to do with a trip is to take it. Congratulations to the class of 1995 2014. It's a Long and Winding Road* Enjoy the journey. *The road has become longer and windier since I wrote this for almost twenty years ago for the class of '95 but more and more one thing is clear; it's the journey that counts. Leave your baggage behind and Enjoy it. *The Beatles classic Long and Winding Road was the No 1 song in June of 1971.